Choose from our great range of designer spare tyre covers in the categories below. 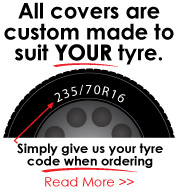 All covers are then custom manufactured to your tyre size. This ensures a perfect fit for YOUR 4x4 tyre, not too big, not too small! From "Adventure Before Dementia" and other funny covers to "Gone Fishin" and lifestyle tyre covers. If we don't have what you like, be sure to contact us as we can design and print anything on our covers in full colour. Want to create your own custom 4wd spare tyre cover? A favourite holiday photo or maybe a pic of your pet? We can help you create any design, or image on your own custom wheel cover. Contact Us and we can show you how easy it is.